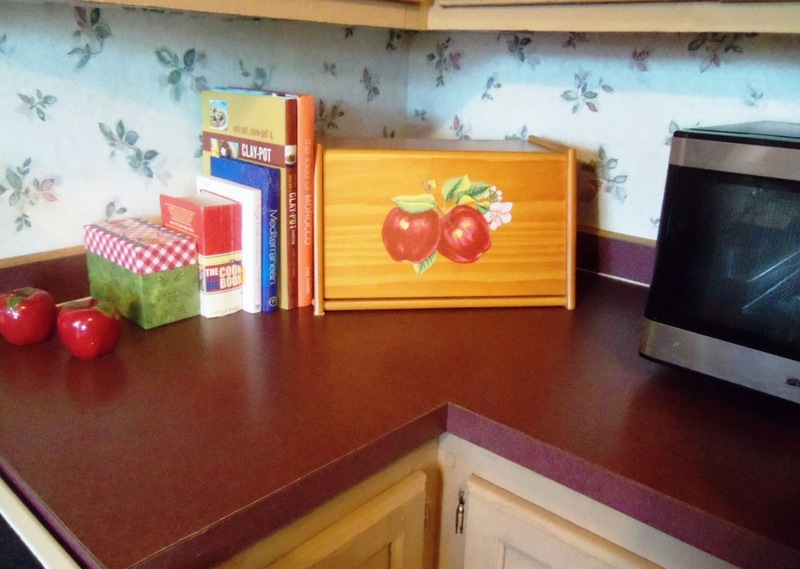 It has been about four months since I painted my kitchen counters and I thought it was time for an update on how they were standing up to all the use they were getting. If you have not seen the before post and pictures you can check them out here. 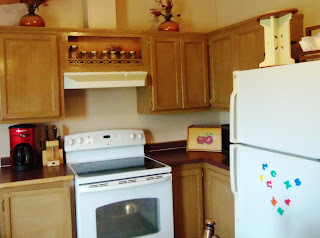 Painting the cupboards was the worst part of redoing our kitchen. I found a paint color I like at the hardware store. It was in the Valspar signature collection. The color was Terra and had an earthy marble affect when applied. I specifically asked the paint mixer at the counter if the paint would work on my kitchen cupboards. I was assured that it would work fine. As I knew once a paint is custom tinted it could not be returned. At $45 a gallon (we needed two in the end) I wanted to be sure it was right. Once we had put the first coat on the cupboards I realized the paint was not washable. Not to get to detailed here I was extremely angry. After a trip back to the hardware store the solution was to paint a clear coat over the cupboards. Now on to the walls. If you remember the wall paper was white and printed with green leaves and burgundy flowers. I painted the walls the color Imperial Sand. Last to be done was our counter-tops. This is the paint I used. I found the Rust-Oleum counter-top paint to be easy and fun to use! I like how it with stands the abuse of my husband and son. They are both very hard on surfaces. I thought there would be a problem with the paint scratching and peeling. Well, I have not found one scratch and no peeling after four months. I have only one problem with the counter paint. When water sits on the surface for a while the spot becomes white. Now I know this is a water spot that can sometime happen on furniture. Like I said before my guys are rough on the counter and get it wet all the time. They do dry off the counter when they get it wet but often times they miss a spot and that's when it gets a water spot. The spots do fade away once the surface is let to dry. I did some research and what I found was the paint needs to cure over time. Once it has finished curing the water spots will no longer happen. 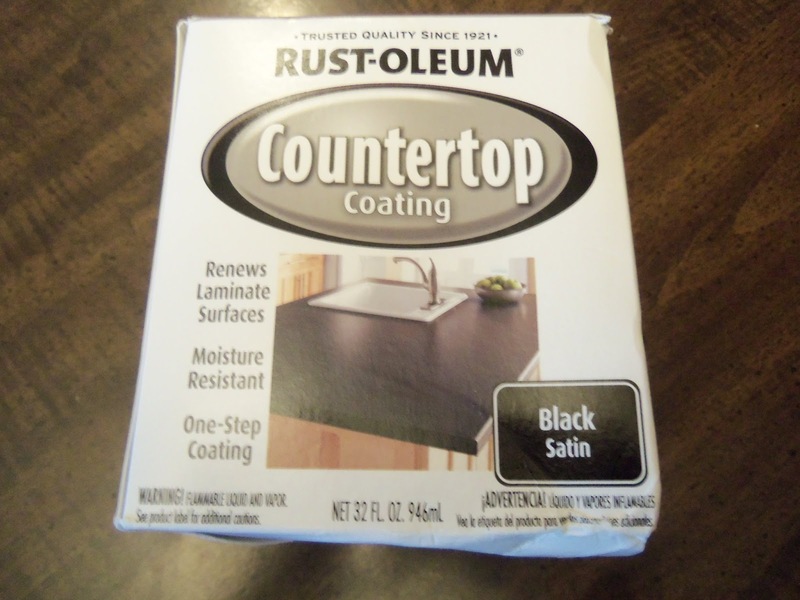 I have a couple tips that might help if you decide to paint your counters. 1. Make sure your counters are clean and free of dust, grease or dirt. 2. Sand each and every inch of surface as instructed then wash again. 3. Tape off and cover all surfaces that will not be painted. This paint is thin. It can splash and drip easily. 4. Wear goggles & gloves. Have a spare pair of gloves available for quick change. The paint will stick to your gloves making all your fingers stick together. Lol, lesson learned. 5. This paint dries very quickly. All needed supplies should be at your finger tips. Believe me there is no time to find a smaller brush or a wet rag. 6. I found the sponge brushes worked best for me. I first tried an expensive foam brush and foam roller. The foam brush left bubbles on the surface. A regular brush left lines. I was very lucky to have a couple cheap sponge brushes and rollers I had intended to use on another project just laying near by. It would have been bad to let the paint dry with bubble or streaks on the surface I had already painted. I suggest having a few types handy for your project. I believe the surface might have something to do with how the paint and brushes react together. 7. Make sure the work area is well ventilated. This paint has a very strong odor. 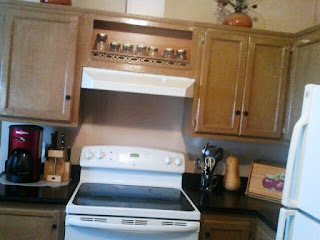 I enjoyed working on my kitchen and am mostly happy with the results. We have a lot more work to do before it is complete. For now I need a break from the kitchen and I am contemplating starting on the guest bedroom or bathroom. I am not sure which to do next. Have you painted anything lately? I would love to hear about your projects. Hi Bonnie, I admire you for even being willing to paint your cabinets. I'd never be that brave. BUT--yours look wonderful. I'm proud of you... You are just so talented. I think it turned out great and is even better that it stands up to the use of MEN!!! I love the black! We get water spots on our countertops too. They're pretty harmless at least. I have a bathroom counter that really needs to have something done to it. It is sooooo dated looking. Hi Bonnie -- I have been researching painting countertops when I found your blog. 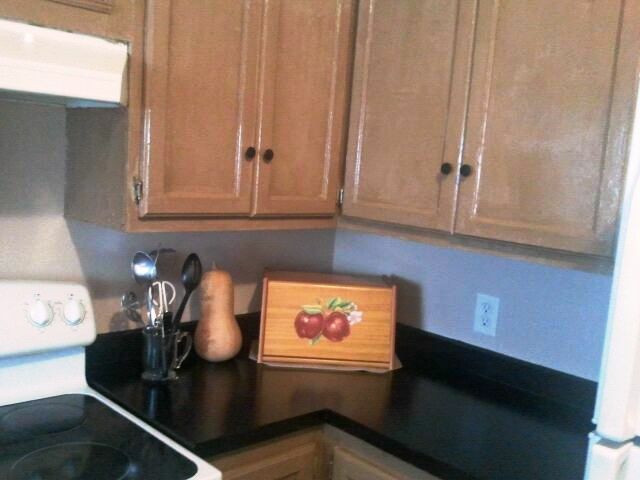 I see your countertop painting project was done about a year ago. Is it still holding up as well as you would like? I appreciate your tips and comments on the subject. Looks like you did a beautiful job and I am now more inspired to give it a try. I sure need a solution less expensive than ripping out my counter top and installing new. Thanks again!